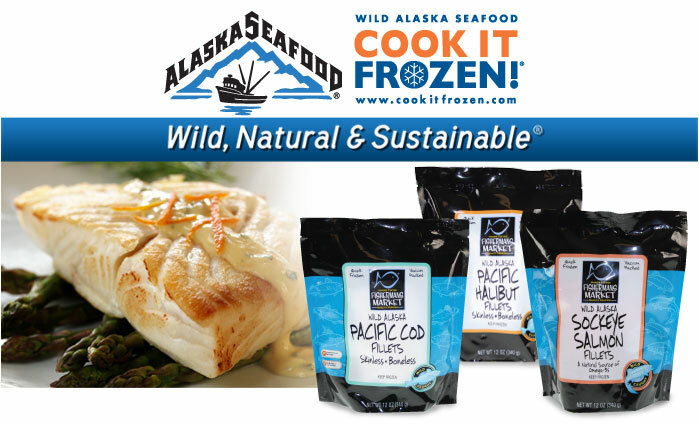 Frozen Alaska seafood is some of the highest quality seafood available. Surprised? It's a fact. By rapidly chilling seafood, then flash freezing and covering it with a thin glaze of protective ice, seafood quality is maintained. Frozen seafood can be held in your freezer for several months, which makes frozen Wild Alaska seafood the ideal pantry item - open your freezer and it's ready to cook anytime you're craving fresh-caught seafood flavor and healthful goodness. No planning or preparation required! Convenience makes it easy to enjoy in as little as 15 minutes. Seafood from Alaska exceeds the standard for flavor and healthful benefits. Harvested wild from icy, clean waters of the far north, Alaska’s fisheries lead the world in their commitment to responsible, sustainable fishing practices. All seafood from Alaska is wild, harvested as it swims free in the icy, clean waters surrounding our 49th State. For 50 years Alaska has followed sustainable fisheries management practices to ensure an ever-replenishing supply of wild seafood. These practices are based on scientific research, and have been commended worldwide for their outstanding success. Alaska’s fishing practices and standards are the result of cooperative interaction between state, federal, and international monitoring agencies. Alaska fishermen are committed to practicing and supporting sustainable fishing methods to ensure an abundance of wild Alaska seafood for coming generations. Attention to quality begins the moment Alaska seafood is harvested. With careful handling, seafood is either rushed to market fresh or flash-frozen and glazed with a thin coating of ice to prevent dehydration and preserve flavor, color, texture and nutritional value. Since 1959, when Alaska became a state and took over management of its fisheries, its constitution has required that “fish…be utilized, developed and maintained on the sustained yield principle.” Said another way, Alaska fisheries follow a government mandate to limit harvests and maintain fishing stocks for future generations. Using scientific research to direct strict harvest capacities, this long-term commitment to sustainable seafood has ensured a continuous, ever-replenishing supply of wild seafood. All species of finfish and shellfish harvested in Alaska’s cold waters swim wild. Scientists carefully monitor each fishery to identify its peak harvest period and to maintain prime stock levels. This ensures the sustainability of a natural, healthy population and ecosystem for successive generations. Time, temperature and cleanliness are critical to maintaining seafood quality. Handled with care from the moment it reaches the ship, Alaska seafood offers a consistent product. The majority of Alaska’s catch is flash-frozen and glazed with a thin coating of ice to protect it from dehydration and to preserve the flavor, color, texture and nutritional benefits consumers count on. How much seafood does Alaska harvest each year? Over 50% of all seafood harvested in the United States, or about 5 billion pounds, is from Alaska. What are the key reasons consumers choose Alaska seafood? A recent consumer survey showed that “succulent texture, great flavor and natural” are the most captivating reasons people eat seafood from Alaska. How do I know if the fish I buy is wild? Ask your fish department manager to identify fish harvested in Alaska’s cold, clean oceans. All fish and shellfish from Alaska are harvested wild. What makes Alaska fisheries the world’s leading model of sustainable fishing practices? For 50 years, Alaska has followed sustainable fisheries management practices mandated by the state constitution to ensure an ever-replenishing stock of wild seafood in Alaskan waters. These proactive practices are based on scientific research, and commended around the world for their outstanding success. How many species of wild Alaska salmon can you name? Five, including King or Chinook, Sockeye, Coho, Keta, and Pink. Do I have to thaw fish before cooking it? You can cook seafood in 15 minutes without thawing it using this easy COOK IT FROZEN!® technique: Heat a nonstick skillet or stovetop grill pan over medium-high heat. Use a pastry brush to lightly brush the frozen fish portions with olive, canola, peanut or grapeseed oil. Place the fish in the heated pan and cook, uncovered, about 3 or 4 minutes, until browned. Turn the fish over, season it with spices, and cover the skillet tightly. Reduce the heat to medium and continue to cook just until the fish is done, which is when the fish turns from translucent to opaque. Use a sharp knife to check for doneness in the thickest part of the fish. Check out additional tips and techniques at CookItFrozen.com. How far and how fast can Alaska salmon swim? Alaska salmon can migrate up to 10,000 miles each year, swimming at speeds around 4mph. How big can Alaska King salmon grow? How large was the largest Alaska halibut ever caught? How big is the Alaska Pollock fishery? The Alaska Pollock fishery is, by volume, the largest fishery in the United States and the second largest fishery in the world. Surimi is a term meaning “formed fish,” and refers to fish pulp formed into various shapes. The Japanese have been making surimi for centuries, with evidence dating as far back as 1100 A.D. The highest quality surimi is made from genuine Alaska Pollock, a fish prized for its delicate, slightly sweet flavor and lean, firm flesh. Surimi is typically molded into crab legs, lobster chunks, shrimp and scallops, and colored to complete its transformation into tasty, affordable shellfish. What are the key nutritional benefits of eating wild Alaska seafood? Seafood harvested from Alaska’s deep, cold and clean waters is low in saturated fat and naturally packed with heart-healthy omega-3 fatty acids. How many oceans/seas border the state of Alaska? Alaska is the only state to have coastlines on three different seas: the Arctic Ocean, Pacific Ocean, and Bering Sea.